Let’s get down to it – this is an interesting mix we have here. Epic Tavern is a tavern and adventuring management simulator RPG currently in Early Access on Steam being developed by Hyperkinetic Studios (based out of Los Angeles, California). The idea to Epic Tavern is that you, the player, run a tavern where adventurers of all types come meandering through your doors looking to quest for riches. Many RPGs have taught us that the local tavern is where one would go to meet like-minded adventurers to gather a party or find a group for an epic quest. The twist here is that you are the tavern owner, but you also want to get in on this adventuring business that is proving quite profitable. As a management game, you will have to keep your tavern up and running to attract patrons. You have food and drink to sell, and lodgings to provide. Eventually, you will want to upgrade certain aspects of your tavern to improve your amenities and offerings to your customers. However, while you are running the tavern, you are also in the process of recruiting and hiring adventurers to join your adventuring company. 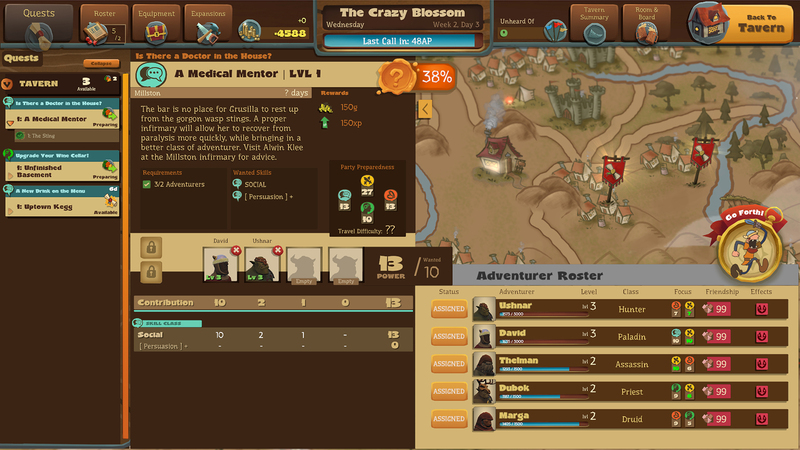 This results in Epic Tavern‘s two main phases of gameplay: manage your tavern and manage your adventurers. 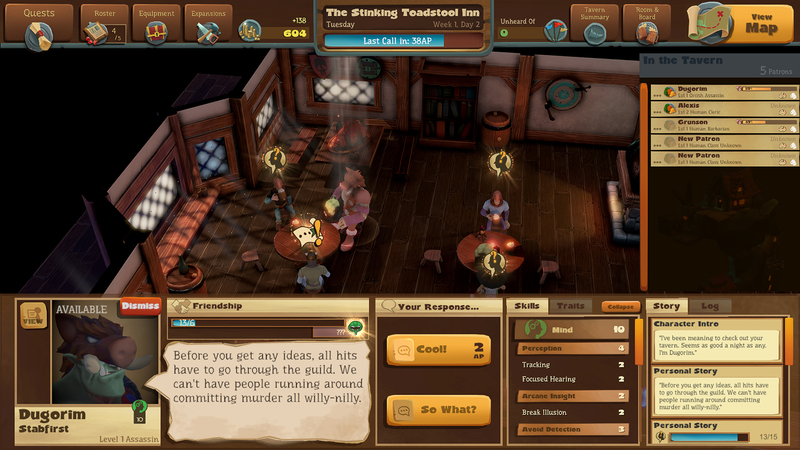 Tavern management is dictated by the time until “last call”, which comes in the shape of Action Points. You’ll have a set number each day to burn through, so there is some strategy involved on how you choose to use them. Offering patrons food, drink, and lodging will require a small amount of AP, but this will in turn improve your relationship with that patron and also add some coin to your bank. Your provisions are not unlimited, so ensuring that you are stocked up will be important. Luckily, if I didn’t have the item that was ordered, there was a quick option to stock that item and serve it immediately, so there wasn’t a penalty for not reviewing your wares (ie, keeping a close eye on your stock) at the start of each day (at least in this version 0.827.5p7h). As your relationship improves with each adventurer, you’ll eventually be given the option to hire them to your roster. Your initial roster will start off small, but as your tavern levels up, you can increase the number of adventurers under your management. After the tavern management phase comes to a close, you can then send these adventurers out on missions from a list of available quests. These quests are provided by chatting with patrons in the tavern and play out like a mini Dungeons & Dragons campaign, complete with story narrative and roll checks. You can equip party members with items, level up their skills, and assign them to a party to take on a quest. Pending success of their quest objective, your team will return with gold, items, and sometimes, tavern upgrades (this appears to be quest-dependent). Each adventurer that you come across has a set of skills, and these skills are the mean by which you will balance out your roster. There are 4 main skills (combat, social, survival, and mind), and each has subsets that can add bonuses to completing a quest. 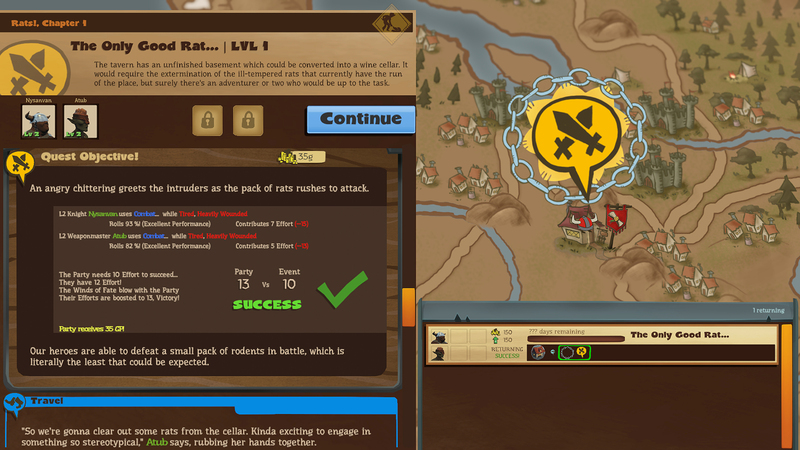 This means that balancing out your team is important for successfully completing your quest objective. What does this mean? One of the first quests that I had executed had assigned the combat skill as the main way to complete the quest objective. My fledgling group of combat-oriented adventurers wandered off to complete the quest, which they successfully did due to their high combat stats. Yet most of them came back gravely wounded, because they had failed survival and mind checks along the way, which in turn affected their ability to fight and complete subsequent quests. With each coming skill check, your party will roll and combine/multiply their skills to successfully perform the check. Should they fail against an enemy encounter, for example, a party member will likely suffer from a wound, which translates to a debuff that could affect their ability to adventure for several days. Passing the check will usually result in gold or party buffs. The narrative style here is entertaining, and appears to be randomly generated. This should keep you engaged as you watch your party move about the map after the bar closes. As we stated earlier, Epic Tavern is currently in Early Access on Steam. I was playing version 0.827.5p7h, and ran into the obvious caveats of a game that is still under development. But the ideas here are solid, and I think that is shows a lot of promise. Personally, I hope that you will be able to have more control over your party as they wander around the map, like finding alternative paths to locate the objective or additional options for critical successes and failures. We will be very interested to see what the final game looks like when it comes out of Early Access, and hope to provide a full review then. Thus far on Steam reviews, it’s generating some good buzz.